Not only does Pasteryak have his father to go to for advice, he also has his uncle to turn to as well. 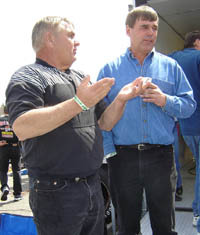 Carl Pasteryak is also a competitor on the NASCAR Whelen Modified Tour. His elders might give Chris plenty of input, but they refrained from telling him what to do over the radio during the race. Editor’s Note – This past week at Waterford Speedbowl, two second generation drivers made their NASCAR Whelen Modified Tour debuts. Speed51.com spent time with both Chris Pasteryak and his father Charlie, as well as Matt Hirschman and his father Tony. We found out a little bit about each new driver, how their races went and what their experienced fathers thought after the checkered flag waved and the dust settled. Chris Pasteryak is used to good finishes at Waterford Speedbowl (CT). 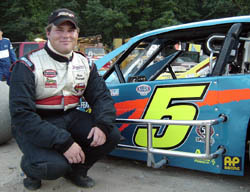 He runs as a regular in the SK Modified division there and is currently second in that division’s point standings. He hasn’t finished outside of the top 10 at Waterford since early May. Pasteryak was also chasing the handling of his racecar. Pasteryak entered the race in the family car – the #5 machine usually driven by his father Charlie, who was very impressed and proud when the race was finished. So when Pasteryak finished 20th in the big race of the night at Waterford this past weekend, he was disappointed. After all, he’s a racer. But looking just a little bit deeper shows that Pasteryak is judging himself much too harshly. Why? Because the race was a 150-lap NASCAR Whelen Modified Tour event and it was his first ever start in the division. When you finish on the lead lap in a race like that, a top 20 really is an accomplishment. 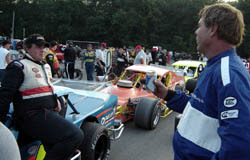 The Tour race came after Chris ran the SK Modified feature and finished eighth. 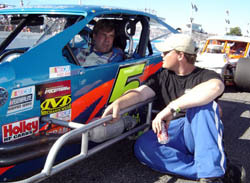 The debut of Chris Pasteryak could be the first step of a transition from father to son in the #5 car. “This is my Dad’s deal and if he’s happy, I’m happy,” said Chris Pasteryak. “He wants to run Loudon and the Thompson 300. Obviously, he’ll run the next race at Stafford because he has already qualified. He’s going to run another race at Thompson because I’ll be racing here every Saturday night with the SK. Charlie has set a blueprint for the change of drivers as well. The 24-year-old Pasteryak got his start in racing just like many other national and regional drivers of his age did. “I ran a Legends car. Mainly here [at Waterford]. But we also went to Beech Ridge, Oxford Plains, Seekonk, Riverside before it closed and Riverhead. I pretty much stayed around New England, but we went down to one race in Hardeeville, South Carolina. By not talking, Charlie Pasteryak got the chance to really observe his son on the track and he is very impressed with what he saw. Stay tuned for the next Speed51.com Father and Son Modified article as we catch up with Matt and Tony Hirschman for their thoughts on Matt’s Waterford debut. 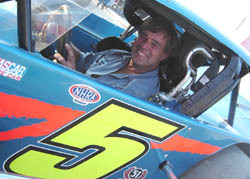 When Charlie was behind the wheel of the #5 at Waterford, he was in street clothes and he was only moving the car.